Why do we need SQLiteDatabase Object? In Android, SQLite is used as database. So before we start coding our app, let’s understand few things about SQLite. SQLite is used as a Local Database in android. We are going to create a project where you will be able to insert/ update/ delete the user records from database. As you can see from the screenshots above initially user will see a list (which would be empty right now, since there are no records) and button called ‘Add‘. By clicking the Insert button, record will be saved into SQLite database and user can see added record on the first screen. By long pressing on record you can Delete or Update record. When you press on delete record the particular record will be deleted from SQLite database. When you press on update record you, you would be taken back to the screen where you inserted your record. And from that screen you can update the record. Let’s start coding our Android app. This layout holds all the records and an Add button to add records. When there are no contacts, we are showing the “No Records” and when user inserts the data, we hide that section. We are using this layout to inflate the records we are inserting. This xml file for two DML (Data Manipulation Language – used for insert/ update/ delete queries) statements of SQLite Database i.e. insert and update. Let’s learn how to create database and table in SQLite database and do the operations (select/insert/update/delete) on table records. Let’s get into java files now. We are creating a java file called SQLiteHelper and extending SQLiteOpenHelper class and It is used to create a bridge between android and SQLite. To perform basic SQL operations we need to extend SQLiteOpenHelper class. Here, SQLiteDatabase.db is the name of your database, and database version is 1. When you make an object of SQLiteHelper class, it calls super class constructor and creates the SQLite database. SQLiteOpenHelper class has two abstract methods that you need to override in SQLiteHelper class. This method is called when database is created for the first time. This is where the creation of tables should happen. If you wish to insert records at the time of creating tables, even the code to insert the records should be written here. Here, we are making a table named PEOPLE in SQLite android. db.execSQL() Execute a single SQL statement that is NOT a SELECT or any other SQL statement that returns data. This method is called when the database needs to be upgraded (Database version changed). The implementation should use this method to drop tables/ add tables or to do anything else it needs to upgrade to the new schema version. That’s all we are going to do in our SQLiteHelper class. Device Monitor window will open. Select your connected device/emulator from device tab and then go to File Explorer tab. In File Explorer tab go to data >> data >> select your project. Now Click on the Pull a file from the device icon(top right corner) and save it with .db extension. Open Mozilla Firefox and then go to Tools Menu >> SQLite Manager. 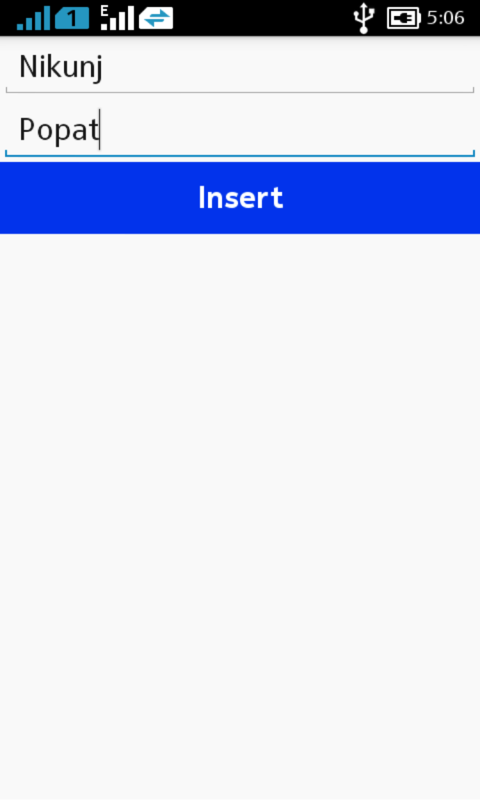 Now In SQLite Manger Go to Database Menu >> Connect Database.Then select your database. P.S. : You can directly create database using the plugin mentioned above. And then you have to import that database in your project directory. You’re doing awesome work till now! Now sit back and relax a bit. We’ll do all the manipulation of data through a model class. So let’s first see our model class (Model is kind of skeleton of the data we want to use). We are working with contacts over here, so I have named my class as ContactModel. We have declared them as String variables in our model class and we have generated getter and setter methods for ID, First Name and Last Name. 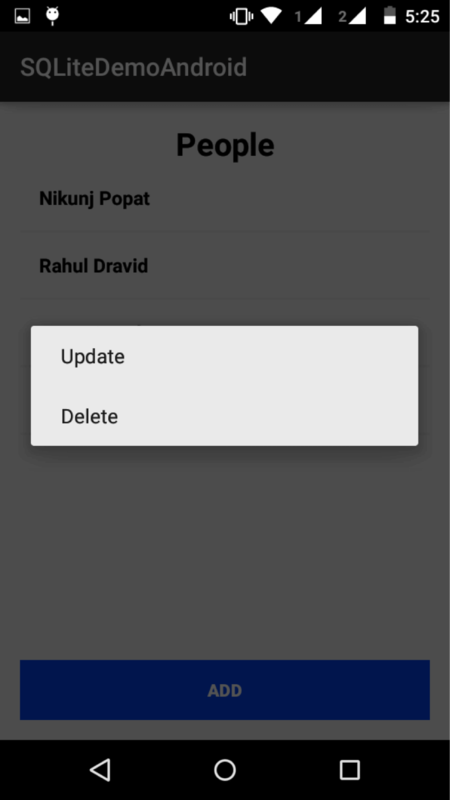 Now we will learn about Inset, Update, Delete and display data from android SQLite database. I would be showing you 2 ways to do each of the operations; there is not much difference in them but its better if you learn both the ways. Our first task would be to insert records in the database which we have just created. To do that, check out the following code. We’ll be using object of SQLiteDatabase class in all the operations, so I have declared it as a class level object. To insert the record, first we are getting SQLiteDatabase object by calling getReadableDatabase() method of SQLiteOpenHelper class. We have set ContactModel class as an argument such that we can get the values of First Name and Last Name from that model. 4.1.1 Why do we need SQLiteDatabase Object? SQLiteDatabase will help you to insert, update and delete the records from table and it also helps you to display table records. If you want to insert / update records, you can do it through ContentValues class by using the put() method. This is a convenient method for inserting a row into the database. TABLE_NAME String In which table you want insert data. nullColumnHack String Optional, may be null. SQL doesn't allow inserting a completely empty row without naming at least one column name. If your provided values are empty, no column names are known and an empty row can't be inserted. If not set to null, the nullColumnHack parameter provides the name of nullable column name to explicitly insert a NULL into in the case where your values are empty. This map contains the initial column values for the row. The keys should be the column names and the values the column values. For safe coding, it is better to close the database once we are done with our operation. We are closing the database at the end with following code. database.execSQL(): Execute a single SQL statement that is NOT a SELECT or any other SQL statement that returns data. update() is the convenient method for updating rows in the database. Value A map from column names to new column values. null is a valid value that will be translated to NULL. whereClause The optional WHERE clause to apply when updating. Passing null will update all rows. whereArgs You may include is in the where clause, which will be replaced by the values from whereArgs. The values will be bound as Strings. Here, we are using database.execSQL() instead of database.update() method. And in the end we are closing the database. database.delete() is convenient method for deleting rows in the database. whereClause the optional WHERE clause to apply when deleting. Passing null will delete all rows. whereArgs You may include ?s in the where clause, which will be replaced by the values from whereArgs. The values will be bound as Strings. The number of rows affected if a whereClause is passed in, 0 otherwise. To remove all rows and get a count pass 1 as the whereClause. Here, again we are using database.execSQL() method to run the delete query and to delete the record. Before we get into the actual code of selecting the records, we need to understand the concept of Cursor which is very important in this context. Cursors store query result records in rows and there are many methods which enables you to access the data stored in cursor. We should use Cursor.close() method when Cursors is no longer used. Now we are getting back to fetching the records from database. I’ll show you two ways to achieve this. First of all, we are querying the database and fetching the records into cursor. The query() method is highly overloaded, and there are variations of the method. The method Queries the given table, and returns a cursor over the result set. table The table name to compile the query against. columns A list of which columns to return. Passing null will return all columns, which is discouraged to prevent reading data from storage that isn't going to be used. selection A filter declaring which rows to return, formatted as an SQL WHERE clause (excluding the WHERE itself). Passing null will return all rows for the given table. selectionArgs You may include is in selection, which will be replaced by the values from selectionArgs, in order that they appear in the selection. The values will be bound as Strings. groupBy A filter declaring how to group rows, formatted as an SQL GROUP BY clause (excluding the GROUP BY itself). Passing null will cause the rows to not be grouped. Having A filter declare which row groups to include in the cursor, if row grouping is being used, formatted as an SQL HAVING clause (excluding the HAVING itself). Passing null will cause all row groups to be included, and is required when row grouping is not being used. oerderBy How to order the rows, formatted as an SQL ORDER BY clause (excluding the ORDER BY itself). Passing null will use the default sort order, which may be unordered. if (cursor.getCount() > 0): First, we are checking if we have got any records in Cursor or not. for (int i = 0; i < cursor.getCount(); i++): If yes, than we fetch all the records by iterating through the for loop. cursor.moveToNext(): Since, the initial position of the cursor is at -1.
cursor.close() After fetching all the records we are closing the cursor since it is very important to close the cursor for safe coding. Now we are fetching records using rawQuery() method that is quite similar to query() method. The only thing which is different in both the methods is following line of code. selectionArgs You may include is in where clause in the query, which will be replaced by the values from selectionArgs. The values will be bound as Strings. We are done with all the database related operations; the next part is about how we are calling the database methods in our Android project. So you can skip the following part if you just wanted to learn about database operations in Android. SQLiteOpenHelper class will create/open the database that we have discussed above. By pressing add button it calls an onAddRecord() method. onAddRecord() method Starts new activity called TableManipulationActivity with request code ADD_RECORD. >> Make an intent object to go from MainActivity to TableManipulationActivity. >> And start an activity for getting result for ADD_RECORD. In TableManipulationActivity get Extra value that we have set on last activity. If request is for inserting the record, then we set the text of the button as Insert. >> First it will check if Firstname or Lastname is empty. If one of the fields is empty then we’ll not move forward. >> Otherwise, we will make an object of intent and put First name and Last name as an extra values of intent. >> Now set the result RESULT_OK. (Standard activity result: operation succeeded). >> finish() the current activity. When we start any activity for result (Remember: startActivityForResult() method), after finishing or getting back from that particular activity onActivityResult() method will called from the last activity (Here, MainActivity). >> Here, we are checking for resultCode. If resultCode is RESULT_OK then we are getting extra values that we have set on last activity (i.e. Firstname and Lastname). >> After getting First name and Last name holding that data by ContactModel class. >> Now check for requestCode. It requestCode is ADD_RECORD then insert record to the table. After calling insertRecord() method we will call displayAllRecords() method to display all the inserted records. Get all records from Table. Getting list of contacts by calling getAllRecords() method of SQLiteHelper Class. Here, we know that SQLiteHelper.getAllRecords() method returns ArrayList of ContactModel Class. Holder class contains one TextView to display full name and two String values for first name and last name holding. >> Make an instance of Holder class. >> Get layout as a view using inflate method. >> Get TextView reference from layout. >> Now setTag view which is ID. 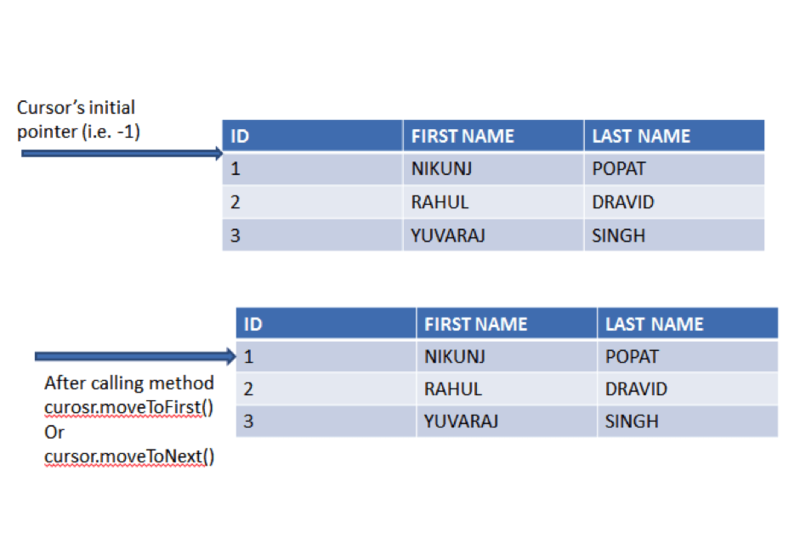 >> Set First Name and Last Name of holder class from ContactModel class. >> Finaly, set person name to TextView by merging first name and last name. >> Set long click listener on inflated view. >> Make AlertDialog.Builder for alert dialog and set both the items to alert dialog. >> Now set click listener for both the items that we have added to alert dialog. which: index of the item that is clicked. >> Update index is 0, when it is called then rowID will be store by calling getTag() method view and onUpdateRecord() method will be called with first name and last name. Here, we are doing same that we have done on onAddRecord() for making instance of an intent. We are passing first name and last name with intent to show it on edit text of TableManipulationActivity. And at the end we are calling startActivityForResult() method with the request of UPDATE_RECORD. >> Start TableManipulationActivity with UPDATE_RECORD request. >> In TableManipulationActivity get Extra value that we have set on last activity. >> If request is for updating the record then set the text of the button as Update. onButtonClick() method is the same method that we have shown at the time of AddRecord. Here, onActivityResult() method will called with UPDATE_RECORD request. >> Here, we already stored FirstName and LastName into ContactModel’s contact object. >> In update we also need rowID which is being affected. So here we also setting rowID. >> And Finally, calling updateRecord() method of SQLiteHelper class. >> For deleting a record long press on record and select Delete. >> You will be asked for confirmation if you would like to delete the record. >> Here, we are making alert dialog for confirmation of deleting record. >> We are deleting the row based rowID, so we have just set the rowID to ContactModel class. >> And call deleteRecord() method of SQLiteHelper class by passing object of ContactModel class. To get all the table names from the current database. I hope you find this blog post very helpful while with How to use SQLite Database in Android. Let me know in comment if you have any questions regarding How to use SQLite Database in Android. I will reply you ASAP.